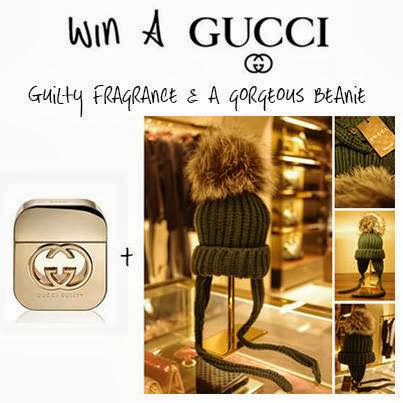 As you know, I love a good competition and the lovely girls at Sales Gossip (in partnership with Andrea Morando) have done it again with the chance to win a Gucci Guilty Fragrance and a gorgeous beanie. Sales Gossip is a fabulous website whose team makes sure that you will be the first to know of any sale, whether it be pop-up sales, flash sales, student sales, designer sample sales and seasonal reductions on the high street in London and online. You can access information on over 600 stores from your PC or smart phone. Andrea Morando offer 100’s of luxury items under one roof making it the perfect place to pick up some designer gems whilst the Husband is transfixed by the footie. To enter, just go to http://www.salesgossip.co.uk/competitions/gucci/ and enter your details. Extra chances are available for sharing the competition with your friends, either via Facebook or by email. You can also enter on Sales Gossip’s Facebook page, where you will also find the competition terms and conditions. You need to be quick. The competition ends on 3rd November 2013. "The Curious Case of Sherlock Holmes & A Mum’s Missing Career"